Look at that: an ad for some kind of fake-hair face-merkins right above an ad for replacement parts for the Lamborghini Miura, one of the most beautiful cars ever made. 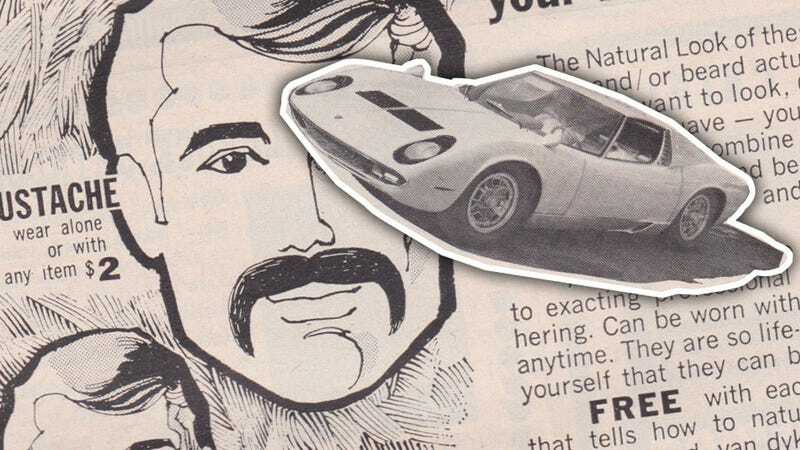 If you were a sad, mustache-less Miura owner who was a terrible driver, always running into things and launching your beardless face through the windshield, these ads together would have been a godsend. Miura parts and a way to instantly grow a mustache? This pair of ads basically Wondertwin-powers themselves into an unstoppable gettin’-laid machine for the lucky late ‘60s gentleman of means enough to invest in a Lambo and a bag of fake stick-on hair. Man, what a glorious time that must have been to be alive, behind the wheel of a beautiful Italian car, your stuck-on beard and sideburns whipping in the wind.